Legionnaires are players who are members of other clans or don’t have a clan at all, and can be invited into a detachment for Skirmishes or Advances. If you want to play with friends who are not in your clan, you can invite them to the detachment as legionnaires. Your clan can also fall back on legionnaires if it lacks clansmen to form a detachment. Moreover, if your clan is not engaged in battles at the moment, or you do not have a clan, you can become a legionnaire and join any open detachment. Via an invitation. Any clan member who has joined a detachment can invite legionnaires into this detachment. With the help of legionnaire autosearch. Click Invite Players in the Skirmish or Advance window. 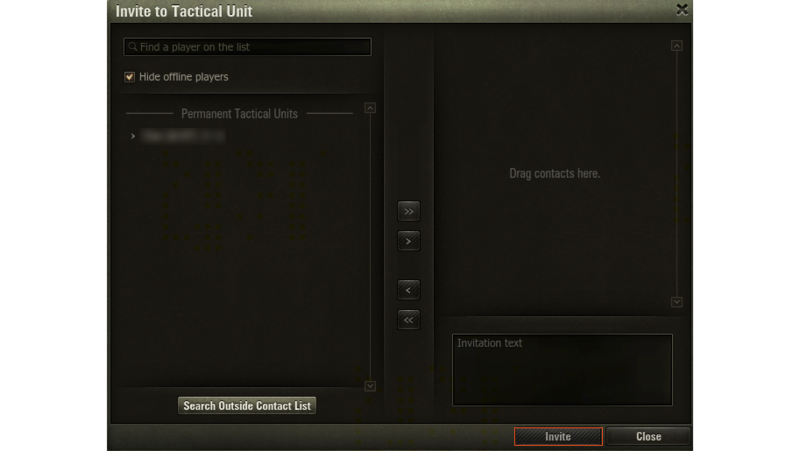 In the Invite to Tactical Unit window, select a player and drag them to the field on the right. If the player is not on the list, find them via the search bar. Type a message (optional) and click Invite. When legionnaires join the detachment, they can perform the same actions as any regular clansman: select a vehicle, confirm they are ready for battle, or leave the detachment. Legionnaires cannot, however, take command over the detachment. The maximum number of legionnaires in the detachment is determined by the battle mode and division. For more information see Advances and Skirmishes. When the required minimum number of fellow clan members in the detachment is reached, the Detachment Commander can send the detachment into battle. The remaining free slots will be occupied by automatically found legionnaires. 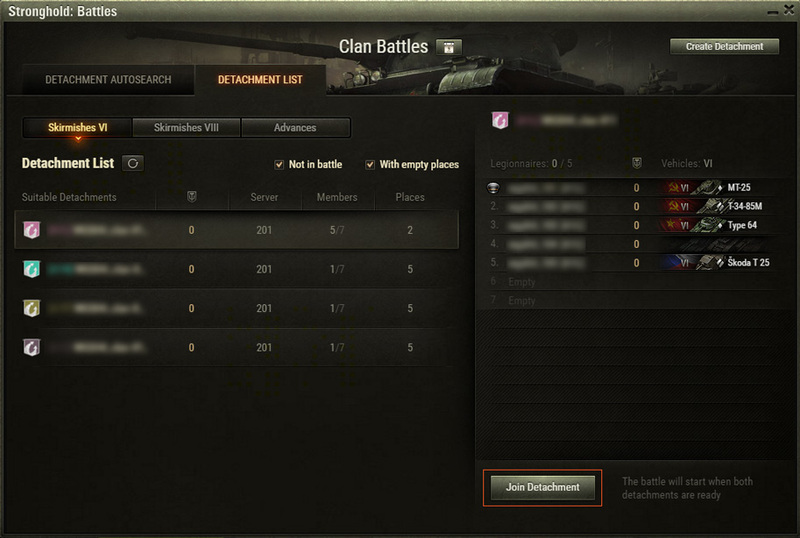 By default, free slots are occupied by random legionnaires or fellow clan members on any vehicle. However, the Detachment Commander can specify the vehicle type or particular vehicles in one or several free slots. In this case, these slots will be occupied only by the legionnaires who have specified the same vehicle parameters in their detachment autosearch settings (see Detachment Autosearch). Legionnaire autosearch is permanently available for Skirmishes in division VI. For Skirmishes in divisions VIII and X, it is available only on the day of War Games. Hover over the free slot in the Detachment Members list. The vehicle type buttons and vehicle filter button are displayed. Use the buttons to specify vehicle requirements for legionnaire autosearch. To reset the settings, click (Reset vehicle selection). The slot will be occupied by a legionnaire whose vehicle meets the requirements. A slot with the specified vehicle requirements for legionnaire autosearch becomes unavailable for other players. The number of slots for specified legionnaire autosearch depends on the maximum number of legionnaires in the detachment. With the help of detachment autosearch. Select Stronghold: Battles in the menu to the right of the Battle! button. In the Stronghold: Battles window, go to the DETACHMENT LIST tab and click the detachment you need. Your name will be displayed in the Volunteers list. Wait until the Detachment Commander adds you to the detachment. Go to the DETACHMENT AUTOSEARCH tab in the Stronghold: Battles window and select a division for the Skirmish. By default, you will join an automatically found detachment on any random vehicle you have. If you want to join a detachment on a particular vehicle, click (Select vehicles), then tick the preferred vehicle or several vehicles, and click Save the selection. To reset the selected vehicles, click (Reset vehicle selection). You will join an automatically found detachment in which the Detachment Commander has specified the same requirements for legionnaire vehicles (see Legionnaire Autosearch). Detachment autosearch is permanently available for Skirmishes in division VI. For Skirmishes in divisions VIII and X, it is available only on the day of War Games. When you add legionnaires to your detachment, remember the special rules for their reward in battles. 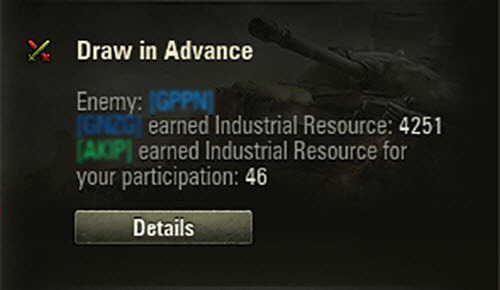 All Industrial Resource earned in battles is distributed equally among all detachment members. But if a legionnaire fought in your detachment, this player gets half of a share, while the second half goes to your clan. Example. Your detachment of 15 members has earned 1,500 , with each member getting a share of 100. If there was one legionnaire, this player gets half of a share ( 50 ). The other half goes to your clan ( 50 ). As a result, your clan earns 1,450. The number of battles fought by the legionnaire is also counted. If there was one legionnaire who played only half of the battles, this player gets a quarter of a share ( 25 ). The rest goes to your clan ( 25 ). As a result, your clan earns 1,475. Industrial Resource earned by legionnaires is credited to their clan’s Stronghold Storage. If legionnaires are not clansmen, their earned Industrial Resource is lost.